My mother was right, March came in like a lamb (I am arguing with her on that point) and so it will go out like a lion. We are expected to get 8 inches today. Lesson learned: listen to your mother! 1. Some relationships are meant to end. 2. My daughter's band concert is the last concert I saw; it was fabulous! Those kids are so talented! The kid playing the sax did an awesome job -- very talented. 3. Spring should be here already! I am impatiently waiting. 4. Oh no! I forgot to drop off my daughter's Kindergarten enrollment papers! 5. I've recently started working out again. 6. 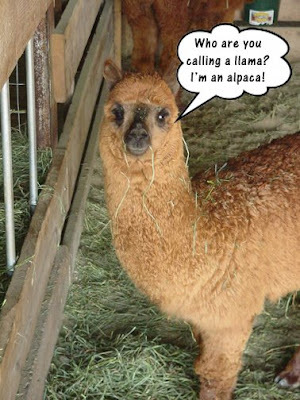 My alpacas never fails to make me smile. 7. And as for the weekend, tonight I'm looking forward to an opportunity to sit down with my hubby and watch a movie or just chat, tomorrow my plans include going to the circus with the kiddos and Sunday, I want to knit! I just couldn't help myself. I ordered another loom knitting book! Crafter's Choice has Isela's latest title, the Loom Knitting Pattern Book on pre-order and it will be ready to ship on May 1st. Considering how quickly the Loom Knitting Primer book sold out, I decided it was best that I jumped on it and pre-ordered my copy ASAP. If you don't want to wait forever and a day, I would suggest you hurry to your favorite online book seller and pre-order your copy today! I am, despite little help from my hubby (he is way too busy to help with the kids most days), starting a new exercise program! It has been awhile since I was able to work out (I tried about a year ago and kids just kept prohibiting my efforts). I was very consistant with my workouts prior to becoming pregnant with my youngest daughter, Amanda. Well, Amanda turned two in December and is at the age where I don't have to watch her every second of every day. She plays for longer periods of time. I have decided it is time for me to devote some time to myself for a change. I have a nice treadmill that I have, up to this point hardly used. I get so bored usually with the treadmill and it is still too cold (let alone too muddy) outside to go for walks here. Plus, I couldn't really do that anyway because an adult still needs to be in the house with the kids, so the treadmill is my only alternative. To aleviate boredom I got a bright idea last night, I dug my portable DVD player out and pulled out my trilogy of The Lord of the Rings series and decided to watch while I walk. I walked for a half hour last night and almost didn't want to stop because I got into the movie! The whole series should be a great jump-start on my exercise program. Image edited (Thursday, March 27, 2008 for clarification. Celebrating Woman's Day 2008 is in full swing! Today features lots of great audios to empower women. Stop by for a chance at today's great Prize Giveaway: Learn How to Make Viral Videos donated by Marie Ynami and a Graphics Package (header/banners/buttons) donated by OnlineWebHelper.com. To enter, all you need to do is stop by and leave a comment on the blog. To triple your entry, simply blog about the Giveaway and link back to the blog post! How easy is that?? I announced this on my post yesterday, however, I did some more work on it yesterday and accomplished some things that I just couldn't accomplish this past weekend since it was just driving me crazy and I just couldn't figure it out...I set up my new pattern blog and figured out the code for the Pattern RSS Feed! This was no small feet since I kept getting XML errors! No matter what I did, I kept getting the same error. Then, when I figured out one error, I got another one! Arrrrgh! I am really excited about this since now you can sign up for my Pattern Feed and have new pattern download links delivered right to your inbox everytime I add a new pattern! How exciting is that??? I have a new patterns blog...and I won a contest! My ever growing collection of personal patterns have a new home -- Creative KJ's Patterns! My list was getting longer and longer and I realized I needed to spend some time and put them into their own blog. I spent most of the weekend (almost kid free) creating a new home for them. I am still adding patterns and have many more I've designed within the past two weeks, so bookmark it and check back soon! 1. My first fill-in Friday is so exciting! 2. Strawberry fields sounds like it is summer, yeah. 3. A nice hot cup of joe sounds like it would taste delicious! 4. Why does chocolate make me feel so good?! 5. The ocean is something I've always wanted to see. 6. It's sad when it is spring here one day and the next day (like today) it is snowing and bitterly cold out again. 7. And as for the weekend, tonight I'm looking forward to a Honey Weiss, tomorrow my plans include going up north to see how far the cabin is progressing (we are building one) and Sunday, I want to have a nice relaxing Easter Dinner! I have to admit I've been pretty sad lately. The loss of my friend has been very hard on me. My children are heartbroken and very sad. We all feel as though the sun won't shine here again. I even saw the Schwan's man today and this wonderfully kind man knew who my friend was because he used to see her every other week when she worked in our home. He too was saddened by her passing. He said she was such a sweet lady. In order to pull myself out of my grief, I've been working on lots of patterns. I am tossing around the idea of making them into a book. I even checked into self publishing them with a company called Trafford Publishing. Their publishing packages are definately doable and it is definately a dream of mine to be a published author. I even have several children's books I could publish with this company too. I would need to illustrate them myself, of course, since I couldn't afford to hire out an illustrator. I have also have been needle knitting to try out new techniques to convert over to my looms. I fell in love with the reverse stockinette and regular stockinette to create patterns on my cloths rather than using stockinette with purls to get pictures. It creates what looks like an embossed image and I just love the look of it. I must be getting better with my needles since they have been what I reach for lately. My March Loom Along pattern is still sitting on my loom and I don't have much desire to finish it! I will be heading to the doctor today so maybe I'll bring it along and work on it while I wait. I am the designer for the May Loom Along on the Loomin' Dishcloths group over on Ravelry. I have the pattern picture designed, I am just working out the technique for the loom (it is a needle knitting technique). I am crossing my fingers it works out! If not, I'll think of something so it is super fun to knit up! Hope to see you over there! Yep! It's a big old muck hole! This thread is currently on my loom knitting yahoo group KniftyKnitterLooms. I've found it very interested so I decided to post my Loom Knitting Q&A here for your enjoyment. What drew you to looming? I learned to needle knit so long ago I don't know for certain how old I was. I can verture to guess I was around 8 years old or so. I have a very distinct memory of showing my aunt that I knew how to knit and she asked me if I knew how to purl yet. Of course I took that as a challenge and had to learn how to purl. I put down my needles and picked them back up many, many times over the course of the past 30 years or so for various reasons, mainly for a lack of time. I also have had many arts and crafts related interests and those various creative endevours took up my time and attention. I took up loom knitting because it had been so many years since I had needle knit that I was very rusty at it. Then one day my sister brought me to this darling little yarn shop that was about 5 miles from my house (about a year and half ago) I spotted these plastic round things and she right away said that her friend's daughter was using them to make hats and she really enjoyed using them. I picked them up and inspected them. Since my knitting needles were long ago packed away and in storage, I decided to purchase a set (I didn't buy them there, but bought a set a day or two later in town at a larger store). I of course was hooked and couldn't get enough of my new found hobby "loom knitting". What is the your next must have loom? What is your favorite thing to loom? I pretty much enjoy loom knitting any small project that I can get done and admire. I don't get into long and envolved projects. I get too bored with them and can't finish them. My favorite FOs are socks/slippers made on the blue KK since they don't take long to make. What's the next item you really want to learn how to make? Well, my goals for the year for both needle knitting (yep, I picked them up again too over the past year) and loom knitting were cables. I already learned these for both needles and the loom (not an expert by any means but I am confident I can read most patterns written for cables on both the loom and needles), so now my goal is to learn how to knit lace on both the loom and on needles. I also want to needle knit this cute t-shirt from Mag Knits. I of course want to make my own graph. Once I learn to needle knit it, I would like to make it on the loom and make a graph that says "I loom knit, therefore, I am". 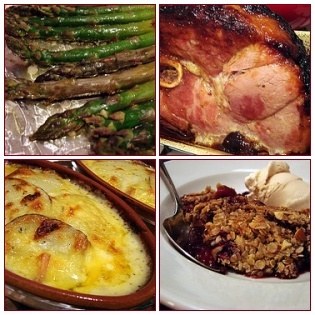 Is there anything you've tried to make and ended up giving up on? I tried lace but had too many projects going on and had some patterns I was working on writing that I put it down and it is still sitting on the loom I started it on as a UFO. Was there anything you thought you'd really goofed and ended up loving? Whats your favorite yarn to work with and why? 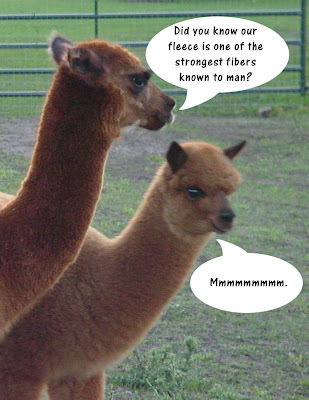 Alpaca! Because I have five of them running around in my back yard! LOL! That seems to be the case. I have kept very few of my FOs. Do you have a tip or advice to pass on? Don't worry if a pattern doesn't make sense. Trust the pattern and try what the pattern designer wrote out first and if it doesn't turn out then give them a holler. Usually patterns don't make sense until you do what it says, and then, aha, you do it and it is all clear. What other crafts/hobbies do you enjoy? Ever since I found out I haven't stopped crying. I cried all night. I was thinking of her while I slept (although I know I slept very little) and when I woke up there were tears in my eyes still. My children loved her so very dearly also. My stepdaughter told me last night she was like another mother to her. She was the Godmother to my two little girls. She was my spiritual mentor; someone I laughed with; someone I cried with; now there is a hole in my heart where she belonged. I want to write about this. I want to find my words and let some of this anguish go. My friend walked side by side with the Lord during her life. She let anyone and everyone know how strongly she felt about her Savior and trusted in Him completely. Despite the heartache of watching her children from a previous nanny position move half way across the world to Australia, the Lord sent her to our family. She didn't want to be a nanny again, her heart ached still from missing her first two children she cared for. God called her and she came to us. We hired her as our nanny for our children while I was pregnant with my daughter Paige. My husband had just gotten full custody of his three children, and we also had my son. My pregnancy with my daughter Paige was a very rough one, I was on bedrest for most of the last trimester and I ended up having Paige taken via c-section when I was 38 weeks. Sheila and I became instant friends. We even shared the same middle name, and we both favored the color purple, and we even said the same table prayer. We were the best of friends despite our 20 year age difference. Sheila nannied our five children until the Lord brought David, the man she married (she was previously widowed), into her life. We had a hard time seeing her go. She did so many wonderful things for our family. Our son Sam (my stepson) benefited the most from her presence in our family. He suffered from a condition called sensory defensiveness. He ate very little when my husband got custody of him, and what he did eat was nutritionally imbalanced, Sam was deathly ill. She was the one to get Sam to eat. As a result, Sam flurished in her care. My friend always had a smile on her face. She was quick to laughter and rarely got angry. She would talk your ear off if you let her. The only time she was quiet and without words was when she wasn't feeling well. She prayed without ceasing. She prayed for me and for my family constantly. I feel guilty for not remembering to pray for her as much as she did for me. Sheila never had children of her own. She was pregnant a few times, but each time she miscarried. She had always wanted children. This is the main reason why she wanted to be a nanny. My friend had the singing voice of an angel. She was very gifted musically. She even sang a solo at my youngest daughter's baptism. I am happy for my friend. I know she is is up in heaven meeting her babies for the first time. I know she is back together with her first husband and I know she sitting down chatting it up with the Lord. And when she can, I know she is singing with the angels. She is free from pain and she has left this horrible nasty world behind. Goodbye my friend, may you rest in peace. Isela posted on her blog signs of spring in her hometown. 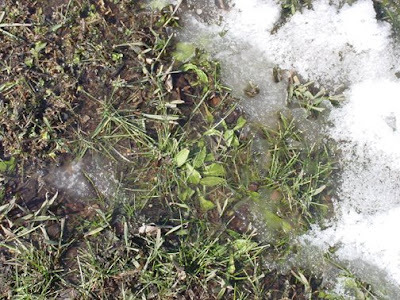 She asked us to post pictures showing signs of spring on our blogs. Are there signs of spring here? Well, not quite. In a few days though I hear it is suppose to maybe get up to 40 degrees! Wow! Bikini weather! Well, in Minnesota anyway! LOL! I did spot a mud puddle forming by the garage when I went to bring my daughter to school today. 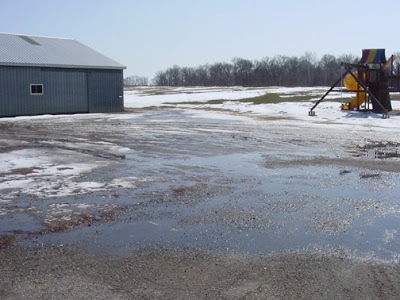 There was a little melt off of snow from the garage roof, that's all ;-(. I am still getting these terrible dizzy spells. I am just miserable with it. One minute I am fine and the next minute I am falling over. I got up in the middle of the night about two weeks ago and thought I was going to die. I was so light headed and faint. Then I got a sharp pain in my pelvis and got really sick to my stomach (probably from the pain). I have lots of things I want to design, but I keep sitting down to work on them and get so dizzy (I did get three more graphs done but haven't written up any directions yet). I can't look at anything for very long. I did start needle knitting a cabled dishcloth because that was one of my personal goals for this year (learn cables on a loom and on the needles). It is turning out just gorgeous! I made a little boo boo though on one of the cables, I didn't have my working yarn in the right spot (it was behind the cable needle in back rather than in front of it) so I have a thread wrapped around one of my cables. Must have been a dizzy spell! Oh well, I'll still use it though. The March LAL on the Ravelry Loomin' Dishcloth Group is in full swing. A couple people posted pics of their finished cloths. They all look fabulous thus far! Great job everyone! 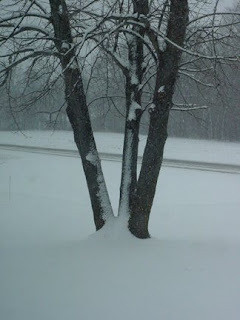 I don't have any pics of signs of spring. I sure wish I did. I am a summer girl all the way. 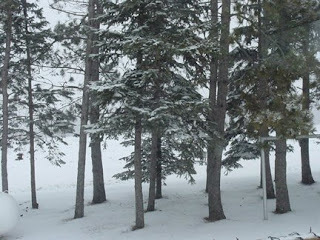 Since we haven't had enough snow to snowmobile, I'd rather have spring. 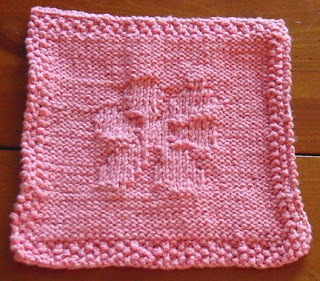 Just in time for Saint Patrick's Day, my gift to you, a loom knitting Shamrock dishcloth/afghan square pattern. Enjoy! Knitting Loom: Fine gauge loom or Dishcloth Rake with a minimum of 35 pegs. Yarn: Approx. 200 yds 100% cotton medium/worsted weight yarn. Cast on 35 sts (clockwise on a round loom or left to right on a single sided rake). Crochet bind off. single crochet in between each loop join. Weave in ends with yarn needle. Copyright 2008 Karen Gielen for personal, non-commercial use only. All rights reserved. What are you loom knitting? Just for fun...a loom knitting meme. What have you made with your loom? What do you do knitting/fiber related? Copy and paste the following meme into your blog and link back to me by commenting to this post. Knitting with banana fiber yarn - no, banana what? Twisted stitch patterns - yes, ewrap anyone? Knitting with alpaca - yep! Household items (dishcloths, washcloths, tea cosies…) - lots! Knitting socks (or other small tubular items) - yes! 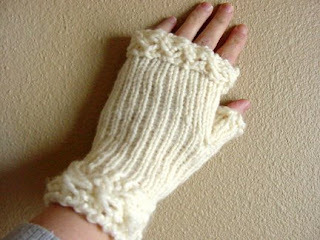 Knitting with cotton - yes! Knitting with beads - no, sounds fun though! Swatching - yes, the dreaded swatching, I'd rather not! Knitting and purling backwards - huh? Baby items - didn't we ask this one already? Knitting a pattern from an online knitting magazine - yes, Loom Knitters Circle Mag! Knitting on a loom - uhhh, yeah! Play along if you like. Adapted from the Knitting Meme. 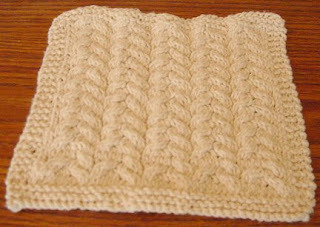 A month of birthdays, March dishcloth LAL, and getting my feet wet with cables. 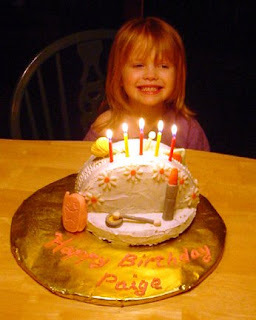 My little Princess Paige turned the big 5 on February 27. 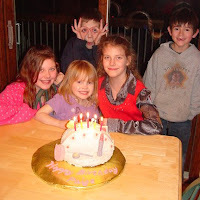 We had her birthday party this past weekend since my parents need to come from far away so they make a weekend of it. Poor dear had the flu on her birthday and was so sad, she wimpered to me "oh, why do I have to be sick on my birthday?" We partied it up this weekend though and she forgot all about being sick on her actual birthday. Here birthday cake was inspired by a cake in 50 Easy Party Cakes by Debbie Brown. 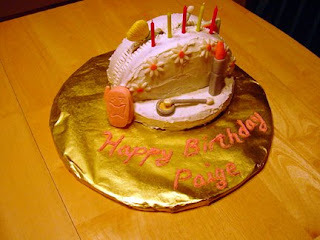 I have been battling the flu too so I didn't have time to really think about her cake this year. Paige helped me out and picked out what she wanted so I made it for her. We don't use gum paste over the whole cake though since no one really likes the taste of gum paste in our family. I just used it for the cell phone, eyeshadow, eyeshadow applicators, blush, blush brush, lipstick, and flowers. The rest of the cake was made with homemade frosting. It went together quickly and turned out just darling! Here is Paige with Kim, Lexi, Sam, and Kaden. Our sixth child, Amanda, was sleeping and didn't get into the picture this year. February was also the month to celebrate my Dad's birthday (February 5th) and my mom got a bithday this year too...yep, she's a leap year baby! She turned a whole 18 years old on Friday, February 29th. For my dad, I knit up a pair of the the Plushy Slipper Socks by Isela Phelps from the January LAL on Ravelry. For my mother, I knit up a pair of cabled fingerless mitts using the cabled mittens pattern from the February LAL on Ravelry. 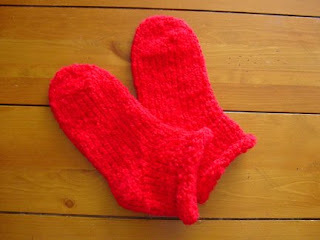 I added the mini cable to the top of the mitts and just love how they turned out! I am so in love with cables now I can't get enough of them. Perhaps I should knit up something from Isela's Learn to Knit Cables on Looms now that I got my feet wet and I have actually made something with cables. They turned out to be EASY AS PIE and not at all as difficult as I was making them out to be! I am the designer for this month's LAL for the Loomin' Dishcloths group on Ravelry. This month everyone wanted to learn how to do colorwork in a dishcloth so I obliged. 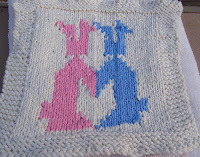 I thought I'd give everyone a jump start on knitting up Easter cloths and designed this adorable Bunnies In Love dishcloth for them. The skills everyone will learn with this LAL are intarsia knitting on a loom and reading a chart. With intarsia or colorwork on a loom, learning to read a chart is critical. Although I wrote the pattern out, anyone knitting up this cloth will soon find out that reading the chart is going to be a lot easier since it is a very visual process to do colorwork. 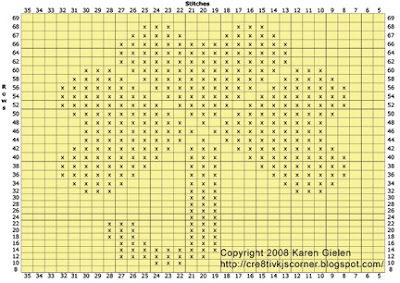 From the chart you can see at a glance what color comes next and you can also see when you will need to add a new color or bobbin and if you need to get more yarn for a bobbin. If you are just following the written instructions, this isn't so apparent and will cause you a lot of headaches. Many thanks to the ever so talented Stephanie McElheran for test knitting this cloth for me!